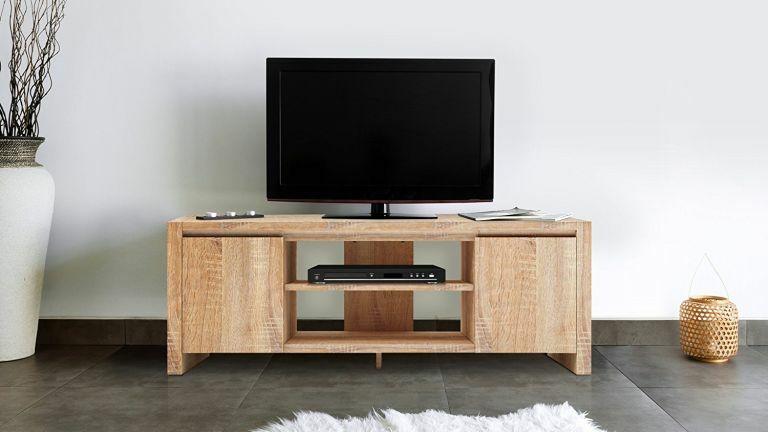 TV stands: the must-have items for any avid television watcher. For many of us, the television is the very centre around which the living room, and our leisure time, orbits. We set up our furniture to face it, we carve out time to watch it, and in this golden age of indoor pursuits, we watch films, stream shows, and even play games on it. So why not treat it with the respect it deserves by giving it its own TV stand? We've found the very best below. Use our guide to choosing the best living room furniture to double-check you're picking wisely, too. What to consider when buying a TV stand? If space is at a premium, go for a TV stand with storage, such as drawers or shelves to hold your DVDs, CDs and video games, or a modular design where you can add or take away depending on your requirements. Even better, you can also get corner consoles which fit perfectly into otherwise unused space, leaving you more room to loaf, sweat along to that exercise video, or flail about wildly as you try to beat your offspring at Wii Tennis. If your TV is in the corner of your living room, a corner TV stand or unit is really the only sensible choice. There are a couple of practical concerns to keep in mind, too. There are the dimensions, of course, to make sure the footprint isn’t too large or too small in the scheme of your room, but be sure to also check out the maximum supporting weight of the console – if you have a mammoth television, obviously go for something larger and sturdier. TV stand or art installation? This good-looking unit does both. It’s by far the priciest option on our list, but for good looks, the Wave TV stand by Terence Conran is far ahead of the competition. In your choice of oak, white, black or walnut, it fits into every sort of interior scheme with ease, from beach house to bachelor pad. Made sturdily from solid wood, it’s built to last, as well as looking beautiful in any room of the house, and offering ample storage with its two interior shelves. On a budget? The Heart of House Westbury is another handsome solid-wood stand, and a great alternative. This beautiful walnut-effect stand is an elegant addition to any living room or bedroom. Its oval shape offers something a little bit different, and its glass shelves offer sleek-looking low-key support and storage. As the TV doesn’t sit on the surface, but in its own raised bracket, it eliminates distractions from around the screen for seamless viewing. The wiring cut-outs are clever, and keep things looking uncluttered. Like all things IKEA, the BESTÅ is fabulously customisable, so it’s our best pick for tricky spaces. It adds a ton of storage (exactly how much is up to you, of course), with drawers and shelves aplenty, plus minimal doors to keep it all out of sight, or glass doors to show it off. This great value TV stand is ideal for teenagers’ rooms and student digs, or for anyone who needs plenty of room for consoles and boxes. Its three shelves offer plenty of storage for an extensive audio-visual system and are made from tempered safety glass for robustness, a nice match for the matte black legs. Unfortunately, this also makes it a real dust magnet. If the prospect of near-constant dusting makes your blood run cold, and there’s room in your budget, consider upgrading to a wooden model such as the Heart of House Westbury. This beautifully made wooden TV stand will make even the most mundane media collections look like an art installation. The two cubbies and double drawers, with their smooth and sturdy metal runners, offer storage for everything from your favourite box sets to decorative ornaments, and the off-white stain with oak-effect top lends a lovely rustic feel. Best of all, it comes pre-assembled, with just the handles to add. If you liked the good looks of the AVF Buckingham, but would prefer something a little more befitting of a grand country pile, this is a wonderful buy. Its sleek and stylish gloss finish, plus its compact footprint, makes the Alphason Chromium a winner in the simplicity stakes. Perfectly at home in any contemporary space, it features a clever infrared-friendly glass-fronted soft-close door (try saying that three times fast) to keep your TV box contained, and a slimline chrome stand that sets the console up off the floor, creating the illusion of more space. A great storage solution for any small living room. As a compact model that’s capable of supporting a sizeable television (up to 55 inches), the futuristic-sounding TECHLINK Bench B6B has our vote for best corner TV unit. Like the Alphason Chromium, it has stylish glass-fronted doors to keep your router and TV boxes out of the way and free of dust. Unlike the Chromium, it has a considerable amount of storage, so it’s a good alternative if you also to store games consoles or DVD players.